A "rope" bed from about 1840 was hand carved of poplar hardwood, and is charmingly uneven, the cannon ball finials are varied. Pegs to wind a rope "spring" are still on the end rails. The restored finish is in excellent condition on this antique furniture from Pennsylvania. 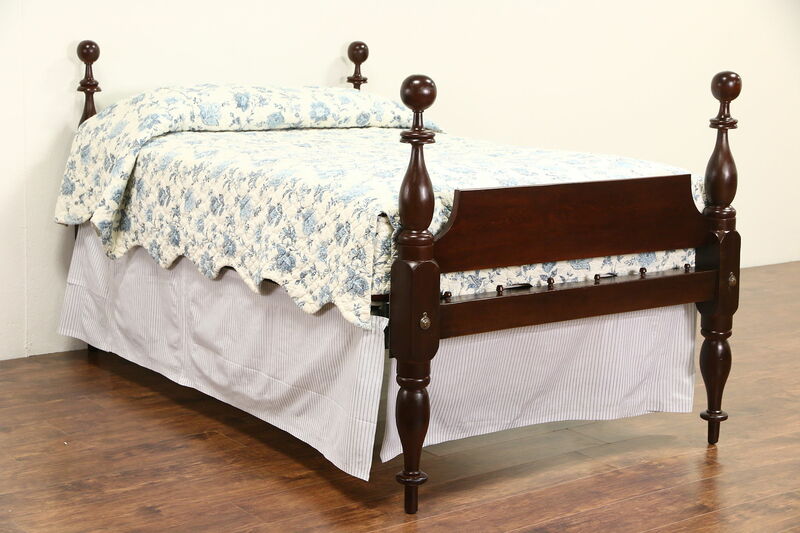 Steel side rails are included and an upholstered platform or bunky board has been crafted to use instead of a spring unit to support a standard full or double size mattress. The demonstrator shown is 12" thick, a thinner one would show much more of the headboard. Size is 51" wide, 48" tall and 84" long.